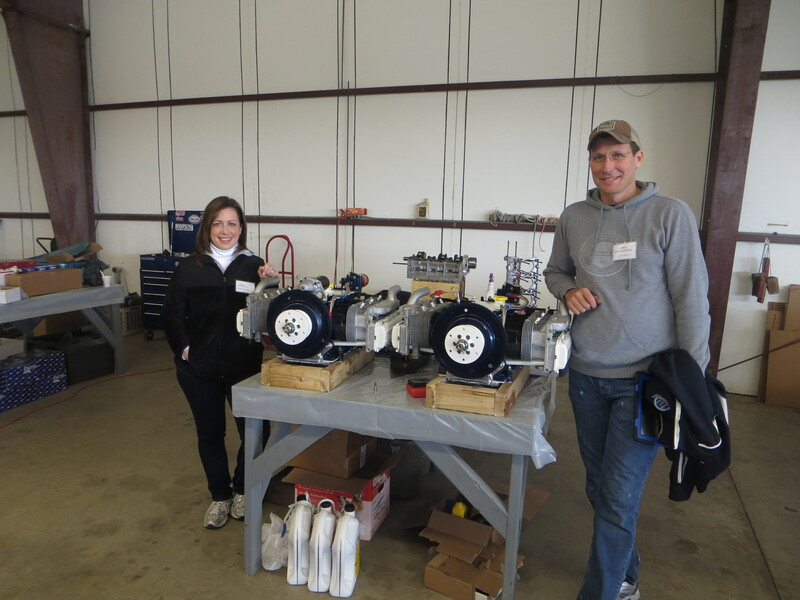 Above, a Corvair College #31 photo of Jim and Ginger with their engines twin 3,000 cc Corvairs, first class motors with Weseman billet cranks and 5th bearings. 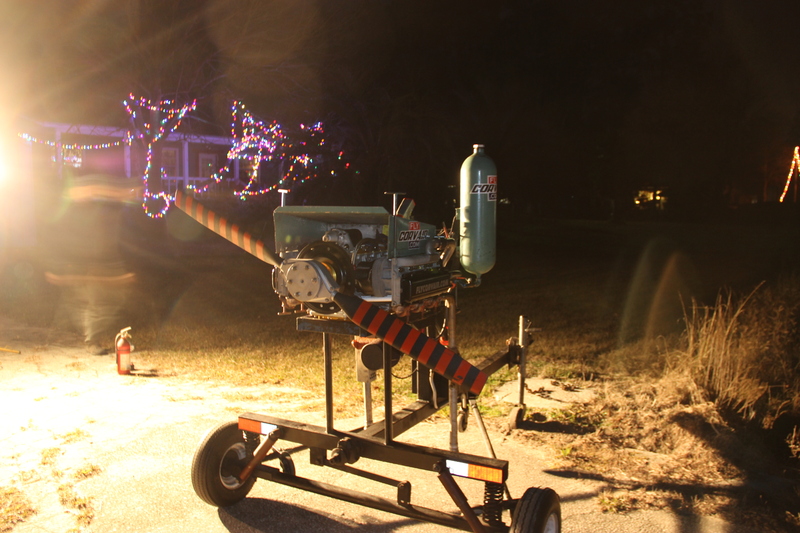 The engines use all of our parts, including 2400-L ultra lightweight starters. Thought for the Day – Corporate trust? In the 1960’s any American who expressed any distrust of the government, even a part of it like J. Edgar Hoover, was instantly labeled a subversive or communist, and publicly marginalized. Today, the pendulum has come full swing, and a significant and vocal number of people consider anyone with any trust in any act of civil government to be a lackey and dupe. It is ironic that that these extremists often ignore the fact they went to public schools, drive on federal highways, fly on FAA regulated planes, eat food made to FDA standards, work 40 hour weeks, enjoy national parks and appreciate things like the internet, the P-51, the Jeep and the .30-06, (which all have their origins in the US civil government). The government isn’t perfect nor efficient, but these people still call 9-1-1 when they have a heart attack because they want to live to complain another day. Moving away from civil affairs, I will say that I am astounded how much trust people have in the giant corporations that have tentacles into most facets of our lives. While I have reluctantly grown used to being treated to unsolicited dissertations on the absolute evils of civil government by people who don’t know how many articles there are in the constitution, very few people ever express to me the same lack of trust of international corporations, as if being in the private sector and devoted solely to making profits insured fully ethical behavior. An odd perspective where lobbing, bribing and purchasing politicians is perfectly acceptable, but actually being a politician of any kind or quality is evil. This week offers a great example of the public trust of international corporations, particularly of ‘brands’ they have been taught to ‘love’ through very effective marketing. So Volkswagen finally admits to a giant scheme to defraud US laws, extending to 11 million vehicles. While VW fan’s were stunned to learn they had been lied to by the ‘nice people’ who make colorful Beetles, I was not. I don’t have blind faith in government, but I do have an absolute faith that management of international corporations will take every opportunity to make profits, even if this means subverting the laws that they couldn’t block from being written in the first place. To give some perspective, there are auto mechanics who have done actual jail time for disabling the emissions control equipment on as few as 10 cars. If the CEO of VW were to spend 5 minutes behind bars for each of the 11 million cars, he would not live long enough to see daylight again. ( Assuming we learned how to send white collar criminals to jail). To VW fans with surprised looks on their faces, or investors who saw their stock value tank 30% in 48 hours, I say get real, wake up, and have another coffee. We are talking about a company that was founded at the request of Adolph Hitler and used slave labor from concentration camps in WWII. To expect the ethics of Jesus from a corporation with such origins is slightly naïve to say the least. A VW fan and perpetual owner I know, who has treated me to countless lectures on the alleged superiority of ‘German engineering’, told be he could hardly believe his TDI was going to have a recall because it produced up to 40 times the legal level of emissions. On the phone I asked him “Let me get this right: You can’t conceive of guys from the Fatherland putting toxic gasses in the air other people were going to breathe and then lying about it?” It was a new idea to him, he was focused on not trusting the evil National Park Service. The Homebuilt aircraft in your shop will be trustworthy because you know the ‘corporation’ that is putting it together, and ‘they’ are driven by learning and doing a good job, not making a ‘profit’ by doing the job as cheaply as possible and subverting every regulation ‘they’ can get away with. In the last 26 years I have seen countless examples of the management of corporations, both big and small, both certified and experimental, lying about the airworthiness of their products, just to make a profit. Go back and look at Cessna still claiming that the C-162 Skycatcher was an ideal beginners plane even after both of the first two examples were lost in unrecoverable spins, in spite of being flown by professional test pilots. Would you like some immunity? Be a homebuilder, build your own skills, work with proven designs, and work with company owners who own, use and speak frankly about the designs and components you will use. 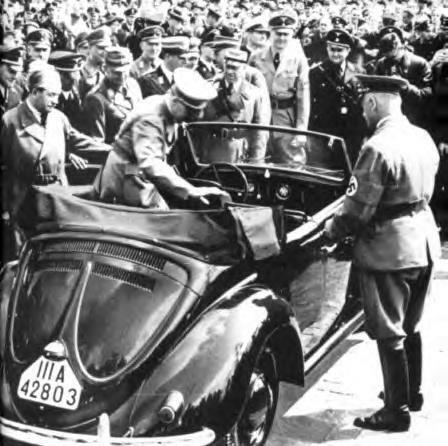 April 20th 1939 was Adolph Hitler’s 50th birthday, and he was presented one of the first VW’s ever made in acknowledgement of his full support of the enterprise. The business was a joint venture between Ferdinand Porsche and Albert Speer. They were not ‘just Germans’, they were both Nazi party members, SS officers, convicted war criminals, and personal friends of Hitler’s. Most Americans have never read Speer’s 900 page memoir “Inside the Third Reich” to understand that even in war, German companies were private enterprises that competed for contracts and made money. Speer was eventually head of all war production in Germany. Convicted of using slave labor, he served his full 20 year sentence, and was still in Spandau prison, long after shiny new VW bugs were popular cars in the US. It was a triumph of marketing to people who didn’t read books. Above, Slave labor from a German concentration camp. VW, by their own admission, used 15,000 slaves, (80% of their workforce) between 1942 and ’45. These were only supplied by the Nazi’s at the specific request of the company ownership. In America we are immensely proud of the factual image of “Rosie the Riveter.” Look at the faces in the above photo to see the difference in two worlds. Our mothers and grandmothers were paid to go to war plants with bandanas holding their hair back. Question: How angry would you be if your mother or grandmother went to the VW plant with a shaved head and a 9mm Gestapo Luger pressed to her scalp? Answer: Odds are you wouldn’t have ever been born to care, as the fatality rate, even among highly skilled slave laborers was more than 50%, for women it was much higher. The parody add run by National Lampoon magazine (the same people who brought you the movie Animal House) in the 1970s. VW sued the magazine for millions of dollars. They were not concerned about the joke or it’s taste, or the Kopechne family heartache. They were only concerned about the VW trademark being associated with something negative for their brand. To their perspective, a valid concern considering how much effort they had spent to go from Hitler’s car to the choice of ‘happy people’ everywhere. Last year I had a guy driving a VW give me a giant lecture about the fact 100% of the cars and trucks I own were built by GM. He was spitting mad, because GM had been bailed out by the US government after the financial crisis, and he told me I was “Immoral” for continuing to drive GM products. I told him I was not a fan of bail outs for either banks nor car makers, but it seemed like a smaller crime than using slaves to further the goals of Adolph Hitler, but if he felt the opposite, I was glad to know it. Full disclosure to those who want to send hate mail – 125 years ago 50% of my DNA was all in Germany. My maternal great grandparents were all Germans. I have been to Germany, I have worked for a German corporation, I have read the works of most German political writers from Marx to Todenhöfer. I have a handful of friends who are Germans, and I have spent far more time listening to them than speaking to them. I have never owned an imported car or truck, but I have no real objection to others who feel the need to. Please read the short note: What the 4th of July means to me. before making a decision about what my position on Germans is. I honestly think the simple fact that Americans are less respectful and obedient of authority may have been the only thing that spared us from following some of the worst leaders of our own nation. I don’t think we are superior, just raised differently. -Besides, I just write these stories to make sure I have a really short Christmas card list. Please note that I never post comments from people that don’t include their actual names. If you have a perspective to share, have the conviction do so with your name. Above, a 2005 photo. With me in the photo is an old friend, Mood Juma. Mood and I got our A&P licenses together from Embry-Riddle 25 years ago. On that day he drove up in front of my Edgewater hangar in his 1967 Beetle and jokingly yelled out the window “I hear you don’t like German cars, and you don’t like people from the Middle East” When we drove it to lunch we had a good laugh all the way. In a few hours I depart for Corvair College #34 at the Zenith Factory in Mexico MO. I will be staying for the Zenith open house on the 18 and 19th. Zenith welcomes all visitors for their event, we have been there the last eight years in a row, it is a very good time and we will be glad to show people the Corvair installation while we are there. You can read more on the Zenith aircraft factory website. Next leg is an 1,100 mile direct drive to My Parents house in NJ. I will be spending time with them until the 28th. I will not be able to cover our shop phone from the road, but I can catch up on Email while in NJ. Please include your phone number in any email you send, in case it is easier to answer the question on the phone. I will be returning to our shop, driving the 1,000 miles back to Florida on 29/30th. The answering machine will undoubtedly fill up in the first few days I am gone. If anyone chimes in on the internet to say they tried calling but I didn’t answer, so they came to the only logical conclusion, that I must giving up aviation to run for the White House , please direct them to this schedule note, and suggest they watch less TV. Do you feel blessed to have good friends? I do. Corvair/Panther builder Paul Salter has a hangar about 500′ from ours. Today he took one look at how much stuff I have packed in the trailer for the trip to CC#34 and noted that the trailer outweighs our Suburban by three or four thousand pounds. He suggested I borrow his Power stroke F-250 for the 3,200 mile trip. In a world where generosity isn’t quite so common anymore, it feels very good to have a friend like Paul. Plus, he gets to tease me for the next year about being the guy who drives a Ford to an event dedicated to teaching people how to build Chevy engines. Old friends know my father worked on the 89th floor the World Trade Center for more than 20 years, rarely taking a day off. We had planned on going to his office that day, but by a small twist of fate, did not. You can read the story here: Holiday Hours, shop dates, Family notes.. I took the photo above on 9/12/01. The letter is taped to Washington Rock, a 500′ ridge a few miles from my parents’ house in N.J. It has a direct view of lower Manhattan from 10 miles. Hundreds of people stood in silence there and watched the smoke pour out of the city. The letter was a note to a dead friend promising to take care of his children and to raise them as he would have. Below it is my Father’s business card. Note the address of World Trade Center #2. Note: This is a ‘Reference Page’, so it will be updated with links to other stories as they are written, including several follow on stories under the Heading “Outlook 2016”. Here is a series that will look at plans and developments we have for the 2016 flying season. Even though we still have two Colleges to go in this year, and much to do, We have long since laid the ground work for a new era in our work with the Corvair. We are implementing many of these changes now, all of them will be in place by the end of the year. Several times I have ‘re-invented’ our approach to the Corvair movement, to better serve builders. The ‘early years’ were a long gestation period to simply show people that Corvairs worked; The ‘Hangar Gang” years were about expanding on all fronts, magazine attention, flying several hundred builders and expanding Colleges; The ‘All Stars’ were about replacing my employed team with independent people who were to serve their corner of the builder’s needs. Things have evolved again, and we now have ‘Outlook 2016’, an era where builders need good information combined with simplified parts delivery from sources motivated to stay in home building for the long run. What needed to be different? The entire point it to make things work smoother, and make the learning and building experience of being a Corvair builder more rewarding. This is not a new goal. We have always worked at evolving how we do things. But to make a ‘sea-change’ level of improvement, as I have done twice before, requires a vision, a long plan, and consistent hard work. We are almost there. At it’s very root, homebuilding can only be defined as Learning. Two people can be the owner of the same model of homebuilt aircraft; What makes them different? One of them will have built nearly part, including the engine, the second is a guy who bought it second hand. Although people speak of esoteric ideas like ‘pride’ of the man who built his plane, let me define it in more concrete terms. The primary difference in the experience of the two people is how well they know the machine they are operating, and that isn’t pride, it is Learning. For this reason, my personal definition of accomplishment is simply the measurement of what our builders learned, period. Although there are certainly exceptions where the original builders learns almost nothing or the second owner is the master of his ship, they are rare and the point remains the same. Reference posts and updates to FlyCorvair.com. Above, Front quarter view of a 2,850cc engine built in our shop. The second half of the equation is the production of parts, the hardware used in learning. It is no secret that many of our most popular items are backordered. There are reasons for this, and the corrections are already in the works. If you have been around aviation for a while, you understand that the 2008-09 recession killed as many airplane companies as the great depression did eighty years earlier. More than half of the companies in experimental aviation tanked, many of them taking a river of builders money with them. We are immune to this kind of disruption, as we have neither a get rich scheme nor investors to please. All we did was adjust production down to meet demand. The affordable end of homebuilding was the last element to come back, and it has done so fairly strongly in the last 2 years, but gearing back up had to contend with expanding our written information base, product developments and serious supplier changes. We were in the process of developing many highly improved versions of our parts: in addition to greatly expanding the ‘learning’ element of our program. We bit off a lot, but I was unwilling to postpone the evolution to were we going. 2400-L Starter , 1100-WW Camshaft Group , High Volume Oil Pump , Ignition system, experimental “E/E-T”, Adjustable Oil Pressure Regulator, #2010A, 2,775 cc Piston and Cylinder kits etc. are all examples of improved products. We have changed 65% of our suppliers: This has both obvious examples, such as cylinder heads, but it also extends to internal subcomponents which are parts of completed items we sell. Few people looking at something as simple as a stainless exhaust system understand that it actually has components from six different subcontractors in each one, and it only takes one missing element to stop production. This is typical of many of our complex parts. It is a reality we have to work with. The modest margins on the parts don’t support coarse solutions like stockpiling large amounts of sub components. Below we have notes for the different solutions we have putting in place. What is different on parts production now? We have already developed and brought up to speed new companies on almost all of the subcontracted parts that became an issue. Old stories of long waits for nose bowls no longer apply, as our new shop has consistently produced batches of 10. All of the new product listed above, like starters, have machined parts from new, motivated sources. These are not changes that you can make with the wave of a magic wand, it takes months to get these systems in place, but we will have these supplier changes fully implemented before 2016, and they, the information, and the parts we sell will serve builders for many years to come. Revised sources, listed by Group numbers, Aug. ’15. What about service in 2016? It is a reality that there is only one of me, and we have several hundred active builders. Any solution needs to be built around this. This is the fundamental reason why I wrote the new manual and put the 700 stories on https://flycorvair.net/. Both of these combine to self answer the majority of questions that previously arrived as a phone call or email. The answers are far more in depth now. Before an email asking about putting a Corvair on a Zenith 601 would require 20 minutes for me to write even a basic response. Now I just send a polite link to this: Zenith 601/650 – Corvair reference page , which has tons of well organized information in any depth the potential builder would like. Having the new manual and website solves a lot of the service issues by giving the new people answers they used to have to ask about. Now Zenith and Pietenpol builders can directly speak with each other on our groups. Combine this with every year generating 200 new Corvair College graduates who are qualified to share what they learned from our in person, hands on training, and we have a new system that provides access to fundamental conversion information, while allowing me to focus on more advanced technical questions. The next element in transformation is the way we take care of orders. The change here is bringing in professional assistance with on line ordering and shipping of our parts. Both Grace and I have been working with an issue that many of you understand very well, aging parents. We are blessed to still have them, and I consider it an understood duty to contribute to the care of the people who gave me life itself. In 2014 and 2015 this has lead to many weeks being far from our parts stocks. Combine this with our college schedules and Oshkosh, and the only practical solution is to bring in professional assistance who can receive and ship orders placed on our webpage, even when we are far away, at Colleges. Oshkosh or with Family. This assistance isn’t cheap, and to make it possible we are going to have a modest across the board price increase after existing orders are filled. I have not changed the prices on prop hubs in 22 years, many of our other items have had no increase in the last 10. The majority of the cost of professional assistance will be covered by us, the rest will come from the modest increase. We are working on an updated products page and automated ordering system that will reflect this, and expect that both will be operational by mid October. We will announce the change when it is effected. Note: Vern, our primary welder, has been out from April until just this week. We had him in the shop for only 4 or 5 days this summer. Traditionally I welded all of our production for years when we had “the Hangar Gang” but in the modern era, Vern doing 75% of it has allowed me to cover many other things. This summer we have built up a list of people who need mounts and other welded parts, we are just working though these now. If you have been patiently waiting, thanks for your understanding. -ww. Last week our piston manufacturer in California, the same one we have used for years to make 2,850 and 3,000 cc pistons, called to say that my order of 2,775 cc pistons will be done by the third week of October. I placed a very large order with them a while back, and these will be delivered in time to make their public debut at Corvair College #35 at Barnwell. These pistons are a large overbore on a stock 1965 Corvair cylinder. They are aimed at being able to run 89 octane auto fuel with 95 heads or 92 octane with 110 heads. 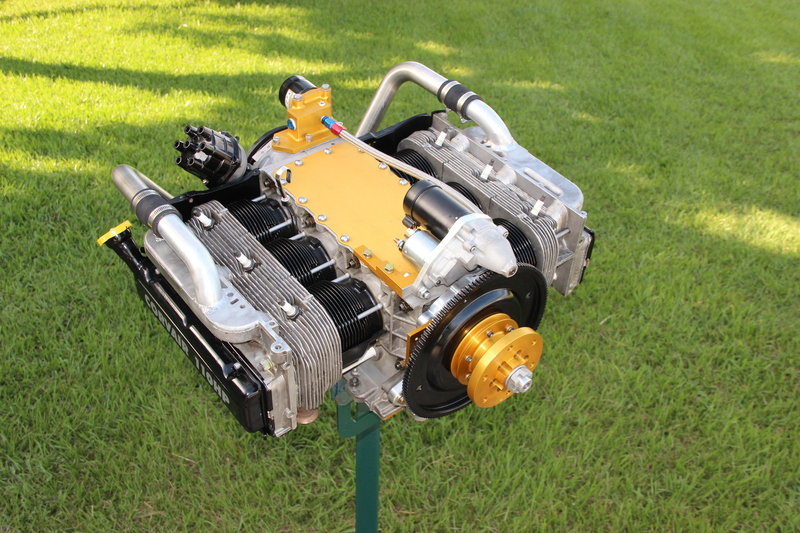 Because they are a bored, the cylinder set is several pounds lighter than a smaller engine, and lighter than a 2,850 with it’s thicker wall full-fin cylinders. I already have several hundred original cylinders at Clark’s Corvairs, ready to be bored to match these new piston sets. These pistons are made with spiral locks, so they can have floating wrist pins, and be easier to assemble than stock pistons which need to heat the rods to install the wrist pins. The ring sets are .060″ over Hastings Chrome rings, the same ones we have put into Corvairs for more than 20 years. Because these pistons have floating pins, they can also use the new billet rods available from the Weseman’s at SPA/Panther. These will not appear on our products page until they are here, we are not selling them yet, we don’t need deposits, etc., but if you are interested, you can always send us a note with “2,775” in the subject line. we will let you know more in a few weeks.